Are you looking for a cheap rental car in Brisbane? VroomVroomVroom lets you compare deals from trusted brands such as Avis, Hertz, Europcar, Budget, Enterprise and Thrifty. Simply fill in the search form above with complete information to begin comparing the best car hire rates. Australia's "River City" is a must-visit destination for sports fans and active travellers. Brisbane hosts many international sporting events, and visitors can tour some of the world-class venues. There is plenty to do in the city - from discovering the cultural centre to taking a swim at South Bank's man-made beach. For those looking to explore further afield, there are islands off the coast, and an array of hiking trails within easy reach of the city. VroomVroomVroom has expert knowledge of the region and can assist you in searching for a rental car. Why book a hire car in Brisbane with VroomVroomVroom? Quick and easy booking system - We want to provide you with the best car rental booking experience with a user-friendly system. Compare, choose and book your car in less than two minutes. If you are new to our website, check out how to book on VroomVroomVroom. Book a rental car from the airport - If you are flying to the city, you can book a hire car at Brisbane Airport with VroomVroomVroom. We want your trip to be hassle-free so all you should do is pick up your rental car upon arrival at the airport. More pick up and drop off locations - There are several collection points across the city. The most popular depot is in Fortitude Valley, just outside of the CBD. By booking a car hire in Fortitude Valley, you can reach the Gold Coast and Sunshine Coast in an hour via the motorway. Wide selection of vehicles - Aside from an array of rental cars, VroomVroomVroom also compares campevan rentals in Brisbane. Great Rates - We have been assisting people find the perfect rental car since 2001. Find out how you can get the best price by checking out our Price Promise. Knowledgeable and friendly customer care team - If you are not familiar with Brisbane, just contact us via phone call, live chat, or email. They will be happy to help you find your most convenient depot. Brisbane benefits from its location in the Sunshine State. The weather is warm and humid for most of the year. Autumn is a popular time to visit the city, when the temperatures are mild. Visitors to Brisbane can find events to attend throughout the year. The city hosts many sports events; cricket, tennis and football are quite popular. In August, the Royal Queensland Show is held at the Brisbane Showgrounds, attracting people interested in all things agriculture. The Brisbane Festival in September showcases the best of the city, with a variety of events and free activities. There are toll roads in the Brisbane region. Make sure you know how you will be paying your tolls when you collect your hire car. Every supplier has different expectations, and most will charge you extra if you do not meet these expectations. Be aware of parking restrictions throughout the city and surrounding areas. If you are issued with a parking ticket, there will be admin fees if the ticket is not paid. For a hassle-free driving experience in Brisbane, read more tips here​. Did you know that you can find a great parking deal at Brisbane Airport? VroomVroomVroom shares with you a range of major suppliers so that your next parking experience is smooth and simple. For peace of mind, take a look at the range of parking suppliers at Brisbane Airport. Brisbane is the third biggest spot for tourists to flock to. It is also Australia's most popular city to rent a car and take a road trip. With parklands, botanical gardens and lush forests, there is plenty to do beyond the booming fireworks lighting the night skies and the growing music and arts scene. Taste the local cuisine or relax on a boat, as it meanders through the city on the Brisbane River. Swimming and rock climbing are just a few more of the many amusements at your disposal, with local transit making everything easily accessible. If you are not 100% sure what to do with your time in the city, we may be able to help with that as well. 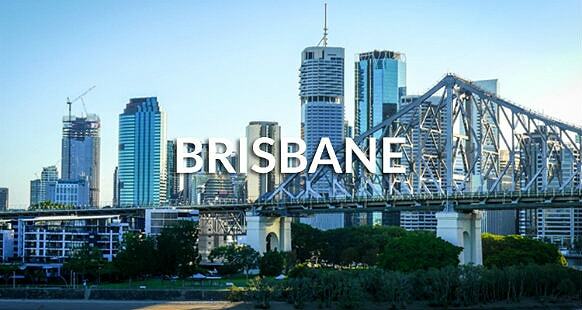 Just like other cities around the world, Brisbane has many iconic things to see and do. We at VroomVroomVroom have come up with a list of things that you can do and places where you can stay during your trip. Check it out below. The best way to see Brisbane and other neighboring cities is by riding a hot air balloon. 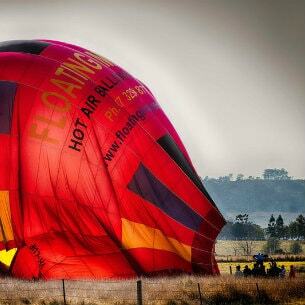 The nearest hot air balloon company is Floating Images, which is just a 30 minute drive with a Brisbane car rental. It is advisable to make reservations in in advance since they only have one flight each day and can only accommodate up to 10 passengers. The flight usually takes an hour so make sure to bring your camera with you so you can take wonderful snapshots of the city and the countryside. However, the whole activity lasts for 3 to 4 hours because there is also breakfast included. If you want a unique movie-watching experience, then make sure to head to Yatala Drive-In which is more than just a Cineplex. It is more of a community event rather than just a normal theatre because you can socialize with other people, camp out, enjoy the starry nights, cruise in your car and of course watch your favorite film! Don't be surprised if you see movie watchers wearing pajamas and carrying their pillows whilst watching film. There is a Candy Bar where you can buy some snacks and goodies. Watch the latest blockbusters at Yatala Drive-In, which airs new movie releases from Monday to Sunday. Whether you enjoy cycling or just want to find new ways to explore the city, you will surely have fun meeting new friends and riding bikes with Brisbane by Bicycle. They offer bike tours that are guided by a local who knows a lot about the history, culture, and local happenings. Instead of using your guidebook when exploring the city, why not let the expert take you to different places including hidden gems and off the beaten paths. Bikers meet up at the park and finishes at a trendy bar in the city. Enjoy a complimentary soft drink or beer after the tour. Witness the distinct river scene by riding a boat through River City Cruises. The family-run business has been offering cruises on Brisbane River for more than 10 years already. Hop on the MV Neptune and head on the decks to enjoy breathtaking views of the city's most iconic landmarks such as the Story Bridge and Kangaroo Point Cliffs. River City Cruises' experienced crew and friendly staff will surely make your trip memorable. The guided tour usually lasts for an hour and a half and you will learn about Brisbane through informative commentary. The boat departs at 10:30 a.m. and 12:30 p.m. at the Jetty A South Bank Parklands. And as a treat to our loyal customers, enjoy discounts on exciting activities in Brisbane like the Brisbane Story Bridge Adventure Climb. Exclusive to VroomVroomVroom and thanks to Experience OZ! Whether you're travelling for business or for pleasure, Park Regis North Quay is the place to be because of its superb location near the Central Business District and Roma Street Station. They also offer a wide range of stylish studios, spacious rooms, and self-contained apartments that are equipped with modern amenities. 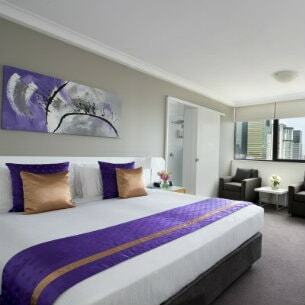 Park Regis also has long stays apartments for those who are planning to stay in Brisbane for a longer period. Take advantage of their world-class facilities including a gymnasium, outdoor pool, sun deck, hair salons and beauty parlours. Start your day right with a delectable breakfast at On Quay Restaurant & Bar which is overlooking the beautiful William Jolly Bridge and Brisbane River. You can also have your own BBQ party on the deck by simply dropping a coin to their BBQ facilities. Enjoy the comforts of modern surrounds and the beautiful vistas of Moreton Bay and the Manly boat harbour when staying at the Manly Marina Cove Motel. Manly's modern premier, boutique motel is less than half an hour from Brisbane CBD and 15 minutes from Brisbane International and Domestic airports. Their award-winning 39 room 4-star motel boasts a plunge pool, daily servicing, breakfast dining room, guest laundry, FREE wifi and foxtel. 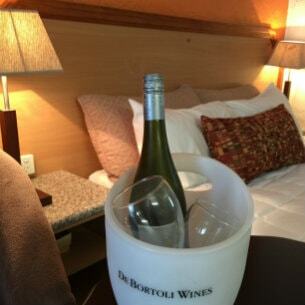 The Manly Marina Cove Motel is the perfect choice for both leisure and corporate guests. Royal Queensland Yacht Squadron and other quality cafes and restaurants are all located in easy walking distance. Alternatively, enjoy the comforts of home in one of our 2 self-contained accommodation options situated on the esplanade in Manly village. The Airport Hacienda Motel's friendly team provides a variety of motel rooms suitable for couples, families and groups all with private ensuites. Free Wi-Fi and free overnight parking are included in all room types. Enjoy dinner and breakfast at the on-site Hacienda Licensed restaurant daily. Take advantage of their modern amenities including their outdoor pool, tennis court and sauna. Weekly and daily car storage are available for all guests. The motel is 5kms away from the airports and city centre; and walking distance to the Brisbane ferry and Portside Cruise Terminal. Are you looking for a luxury hotel near the city centre? Sudima Suites is the place to be because of its first-class amenities and superb location. The 4.5 star hotel is situated in South Brisbane where you can find historical buildings, excellent shopping centres, cosmopolitan cafés, and cozy wine bars. There are several accommodation options to choose from: studio apartments, one-bedroom apartments, and two-bedroom suites. The suites are equipped with a kitchenette, cable TV, high-speed internet, air-conditioning, iPod dock, and other modern amenities. Sudima Suites also has a lap pool, gymnasium, and sky deck. Whether you're traveling for leisure or for business, you can find comfort during your stay at Meriton Serviced Apartments. The company's newly-opened Soleil building and it is the second tallest residential building in the city. The building has 228 luxury apartments that feature various bedding options, sizes and styles to suit the preference of each guest. If you're traveling with an infant, make sure to reserve baby cots in advance due to its limited availability. The Boundary Hotel is one of the oldest pubs in Brisbane and they have been offering affordable food and drinks to the locals and even tourists since 1864. It is considered an iconic landmark in West End because they continue the tradition of serving old favourites. The Boundary has seen a lot of changes through the years with the opening of their new lounges, function areas, and bistro. This is the perfect venue for all your events and gatherings as they offer six cool rooms – from The Blue Room which features a pool table to the spacious Beer Garden which turns into a party venue complete with live music and DJs during the weekends.